Before the indie movement, it was very difficult to find awesome glitter nail polish. It was easy to find glitter toppers, but opaque glitters were rare. If someone released opaque glitters you immediately went on the nail polish hunt to find them. One of these collections was Wet n' Wild's Ice Baby collection. I have one of the polishes from that collection to share with you today. 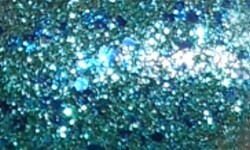 Cost Is No Issue is a fine teal glitter with larger blue glitters in a clear base. Color: I don't think you can ever go wrong with teal and this a gorgeous blingy one. I love the addition of the larger blue sparse glitters in here as it gives this color some dimension. This color is super blingy and I love it. Formula: Excellent formula even after 5 years! I used 3 coats above and the formula is smooth, easy to apply, and just the right consistency. The best part is that it is full coverage. Price: I have seen a listing for this on Amazon, so it may still be out there in some capacity online. Overall: This was a great collection and I love this color. I love the opacity of the glitter and and the bling factor. Not much else I can add to that!